Make sure not to confuse this flavor with the menthol one. Polar Mint is a flavor that offers probably more freshness than the menthol flavor because it intensifies the peppermint even more. When you take a pull of this flavor, chills are the only things you are going to feel. The cooling sensation will travel through your body, but it will not freeze you up. Instead, Polar Mint will refresh you and feel as if the warm summer day froze over. Once you exhale, it will feel as if snow is about to form every time you breathe. Perhaps people should not be near, or you will make them shiver with your breath. The iciness will not feel like a blizzard because the mix of vapor and flavor will balance everything out to give you a great experience. Feeling bad because the tank seems like it is about to be on empty is an emotion that should not be a thought. Every time you older the Polar Mint Blu PLUS+ Tank, the package comes with three tanks to make sure you are able to get enough of this amazing minty taste. 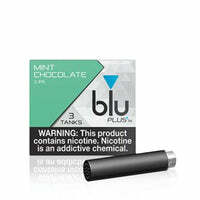 You might consider sharing some of this flavor because you want everyone to know what blu cigs has to offer. However, if you do not want to share it, no one will blame you. It is okay to keep some things to yourself. Besides, if you start sharing, it will be like giving one person a piece of gum, and then suddenly have a crowd of people asking for one too. This slippery slope might be one you want to avoid in order to make sure those three tanks last. Whatever you choose to do, Polar Mint will make sure it leaves a good impression and prove that menthol has some big competition. ***All specifications and descriptions are based on information provided by the manufacturer. Information provided is not representative of testing and or verification by Breazy.com and should be used at consumers’ discretion.